There’s something romantic about this long, all knit jacket. Maybe it’s the hood or the way it flares at the bottom which adds a charm that makes one think of the woods of England. It’s a “quickly knit” project due to the chunky yarn and size 11(8mm) needles. 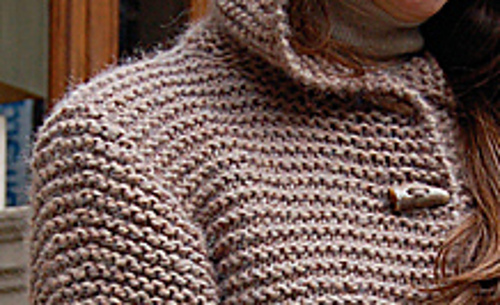 The entire body is knit in garter stitch in one piece, beginning at the hem, and the sleeves are picked up and worked down to cuff. The hood is optional and can be replaced with a collar - although there’s nothing like a hood for a little intrigue! Three button jacket, with hood or convertible collar, is knitted in one piece with shoulder seams. Fitted sleeves are worked from shoulder to cuff with short rows at shoulder. Jacket is wider at the bottom for unrestricted movement.